Sean holds an honours degree in applied chemistry and a certificate in advanced analytical chemistry. He is a Chartered Chemist and a Fellow of both the Royal Society of Chemistry and the Chartered Society of Forensic Sciences, with over 40 years of experience as a forensic scientist. Sean was, until March 2010, the Principal Scientist at the Forensic Explosives Laboratory (FEL) of Dstl, an agency of the UK Ministry of Defence. He has a long and successful track record in the direction, management and delivery of forensic science research. The co-founder of the international explosives expert working group (FINEX) of the European Network of Forensic Science Institutes (ENFSI) and the Forensic Isotope Ratio Mass Spectrometry (FIRMS) network, of which he is currently Director of Quality, he represented Dstl on the board of the Association of Forensic Science Providers and was a director of the Council for the Registration of Forensic Practitioners (CRFP) as well as a CRPF assessor and registrant. 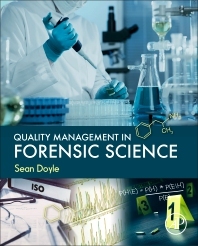 Sean was involved in the earliest adoption of Quality Standards by forensic science providers. FEL was one of the first (if not the first) forensic science laboratory in the world to be accredited to the international standard ISO17025. In his various roles at FEL over a period of 20 years he gained a great deal of experience and expertise in Quality Management and is a Lloyds Register Quality Assurance trained and qualified auditor. He has provided Expert Evidence in some of the highest profile cases including R v Sean HOEY (the Omagh bombing – murder), R v Manfo ASIEDU (appeal against conviction – July 2007 London attacks), R v Mark LUNDY (murder) and provided a report in support of the application for a Royal Prerogative of Mercy for Scott WATSON (murder).